6.21 points at 14 votes (rank 587). 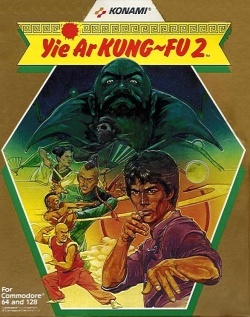 The protagonist of the game Yie Ar Kung-Fu 2, is named Lee-Young and has already done lots of hard work and also reached a lot by it. So he can rightly call himself a Kung Fu fighter. His father's name is also Lee which is not astonishing as the family name is put in the first place in China. But this leads to the conclusion that our hero has the first name of "Young". Or maybe his name is supposed to be "Lee Junior"? Well, Konami is a Japanese company, they might not know exactly how the naming in the neighbour country works. 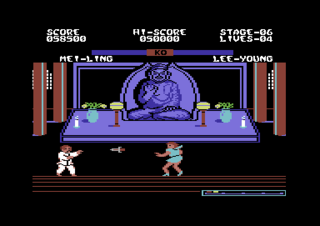 But it doesn't matter anyway, the dad was once the shining hero, Lee Senior, in the forerunner game Yie Ar Kung-Fu. Wait a moment, some of you might think: but the fighting machine from part 1 was named Oolong? 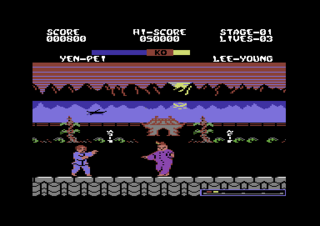 Yes, but not in the NES and MSX conversions, in those the name of the good man was really Lee. 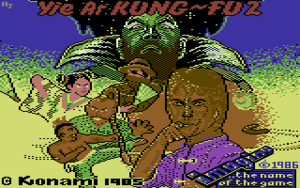 For this you should also know that the background story was also a different one than on the C64. It was not about the final tests to be Kung Fu grand master, but about the feud with the "Chop Suey Gang" (no, this is not a lame joke). Anyway, exactly 20 years after Lee has put the mincemeat gang in their place, the heroic Lee-Young now can tidy up the rest of the gang. Because one of the leaders survived at that time, calls himself "Yie-Gah Imperator" since that time and gathered seven fighting warriors around him. With this rear cover he now wants to have a blast. After all the hard training with his father Junior-Lee is now ready to compete against this gloomy threat and rescue China. This should be no problem, because next to the deadly art of Kung Fu, consisting of four (!) different attack techniques that he has learned from his father, he also masters his own special techniques that are based on OO-LONG TEA POWER and CHOW MY NOODLE POWER!! The aim is to defeat the Yie-Gah imperator Yen-Pei and his seven glorious followers. Fortunately one after the other. When the last opponent is defeated, you start again with Yen-Pei. This makes sense as there is a highscore list. 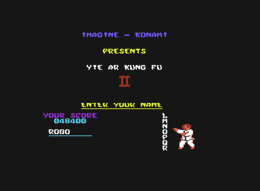 Yie Ar Kung-Fu II is a beat'em up with different fighting scenes and changing opponents that have different abilities. There are four different background graphics and eight main opponents, additionally to those the dwarf warrior and the power-up items. The optical design of the game makes a very good impression. Entering the name into the highscore list. Hit against opponent 300 p.
Hit against mask 1000 p.
Hit against other weapons 100 p.
You start with 3 lives. At 20.000 points and 70.000 points there is an extra life. If you beat up a formation of three dwarf warriors, you will get a tea leaf. With five tea leaves you can make a tea. In practical, this means that you can fresh up you energy supply by pressing the key C= . You can get up to three cups of tea. With this special technique is Lee Young invulnerable for a few seconds. The pot of noodles can be found in every scene of the game. When you pick it up, it is instantly activated. Yen-Pei Long braid Garden The so-called "Yie-Gah Imperator". The end boss at the beginning, something else for a change. He moves rather slowly, you can recognize parallels to "Chain". Lan-Fang Steel fan Garden The lady in blue has usefully short hair. "Fan" was probably her instructor. Po-Chin Fire balls Cave What happend to this man's face? One can ponder about this while avoid his fire-breathing. 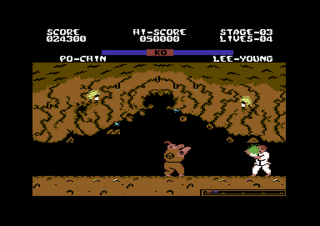 Wen-Hu Mask Cave Next to his green-brown suit also the mask is a part of his clothing. And it is at the same time the weapon. Wei-Chin Boomerang Temple A bald-head with green trousers and a very, very annoying boomerang. Mei-Ling Throwing dagger Temple Nice to look at with her long hair and the bright-blue dress. But there is no time for a date. Han-Chen Grenades Bridge He wraps himself in a trench coat and also hides his face under a big hat. Li-Jen Flashes Bridge Reminds a bit of "Ming" from "Flash Gordon", but is much more dangerous. 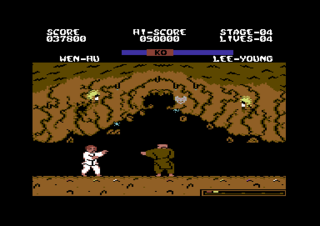 The opponents can disappear at the border of the screen to reappear at the other side. 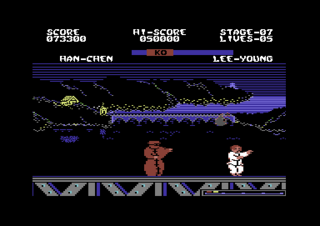 If two human players compete against each other, then player 1 takes over the part of Lee Young, player 2 can choose between Yen-Pai, Lan-Fang and Po-Chin. 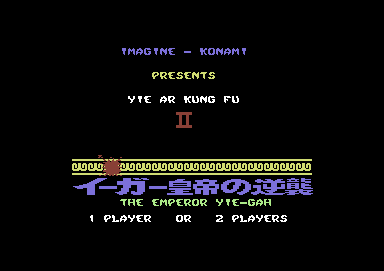 Player 1 uses the joystick in port 1, player 2 the joystick in port 2. At the beginning, jump over the dwarfs to get to the end boss without losing energy. Only attack the dwarfs if you can master the joystick controls. There are no cheats known. But there are cracked version with built-in trainer functions. Shmendric: "In principle it is an entertaining beat'em up for in between, but I was bothered by the controls. I never could quite get used to the commands for jumping. It just deviates too much from the other known "smacking games", this has quite spoiled things for me. Therefore I was never really good in this game and preferred part 1. The music became rather worse, but the graphics were better but not really nicer, the gameplay does not need a further comment. Well and now somehow I'd fancy a chop suey..."
Drunken Master TheRyk: "How dare Konami releasing such a mediocre beat em up!? Just because a software company is located in Asia, it does not mean their Kung Fu games are automatically good. The music - made by a European - is the best aspect of the game, otherwise this sequel of a classic is rather loveless and forgettable, 5 points." 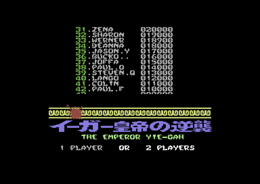 Commodore 64 players can count themselves lucky. Po-Chin only spits fireballs at them, which is surely the lesser evil. In some other conversions it gets significantly more unpleasant, because there he throws around farts ("He attacks with gas clouds"). As a mean consequence they also paralyze for a short time. 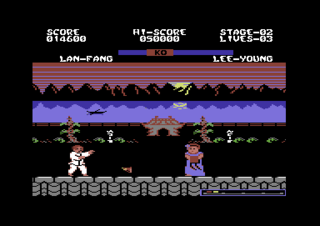 Lan-Fang can be chosen in the two-player mode. Therefore she counts as the first female playable character in a beat'em up. This even amazes the experts: DerSchmu makes a speedrun through the game. 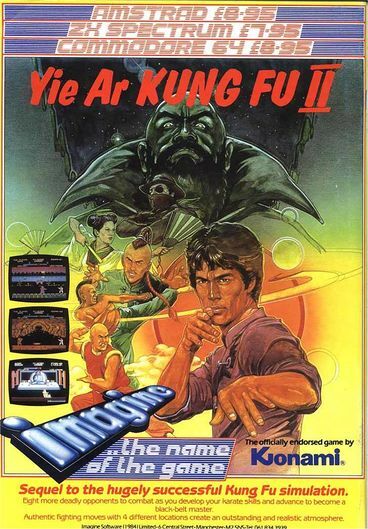 Video at YouTube The title tune by Martin Galway"
Video at YouTube Another longplay of "Yie Ar Kung-Fu II"